USITT19 is inching closer and we’re spending the interim reflecting on the one-on-one conversations we had with award winners, luminaries, and program participants at the USITT/ Stage Directions interview booth in Fort Lauderdale at USITT 2018. 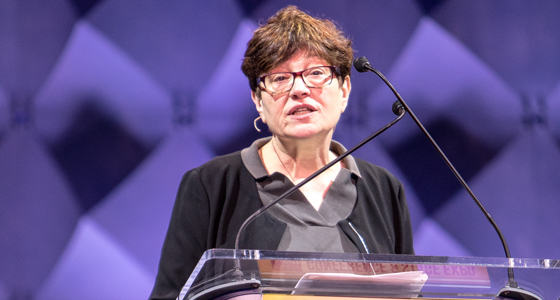 USITT 2018 Keynote speaker and “godmother of projection design” Wendall Harrington sat down with us to at the booth to discuss influencers, advice, and how she found her calling. Well, Richard Pilbrow, in a way, was a mentor, but I didn’t know him for years, only in the sense that there were no other projection designers, so I read books. Richard Pilbrow had a book and he showed me that projection design was possible to do. And of course, I read the early Thomas Wilfred book, Projected Scenery: A Technical Manual, which was the first book of all. I was really fortunate to know a man by the name of Bill Batchelder, who was Jeannie Rosenthal’s slide assistant, and who ran a company called Staging Techniques, a projection equipment rental house. He really, I would say, was the person who helped me the most to understand how the world worked in the theatre because it’s completely not my background. Anyone who influences your work? I’m a sponge. I pick up from everything. I would say that I learn more from Ernst Lubitsch than from anybody, particularly in the theatre. I watch a lot of films and I’m attracted to film lighting. So, that I think has had much influence. And Walt Disney! Those are the kinds of influences that I had because it was a long time ago. how did you get your start in theatre? And then how did that, in turn, lead to projection design? My start in theatre was doing projection design. The first musical I saw, I saw in tech. I grew up in New York, but I never went to the theatre. It was not what we did. And even though in my tiny Catholic high school, I was the head of the drama department because I was the head of a lot of things because I was very anxious and had a lot of energy. So, I sort of cared about theatre and I read a lot of plays. I think everything I knew about the theatre I learned from Busby Berkeley musicals. I really thought that was the theatre. And imagine my surprise. I wanted to be a filmmaker, that was my career or my goal and I was working in the underground film movement in the ’70s, and then there was a recession. So there was no work and certainly no work for women. And I went and worked in advertising because I had a film background, so I did slide shows for corporate stuff. That was how I got started because I had to learn how to make slideshows. Having a film background’s not the same. From there I went to Staging Techniques and Bill Batchelder and the guys helped me. That’s how you learn, you just hang out and watch what they do. I learned how to make slideshows and I started to work with film techniques that were slightly different as opposed to just taking a picture of a picture, which had been the previous way of doing things. This was way before anything digital. You could build something by making multiple exposures of work that was lit from below. That made the imagery quite luminous and the color was very pure and I used to use gels to make the color. So, one day Batchelder called me and he said, “I have this friend, Tharon Musser, and she needs to make some slides.” I had no clue who Tharon Musser was. Right? I go, and I meet her and she rolls out her lighting drawing for the musical, Ballroom and I’ve got no idea what I’m looking at. I mean, in truth, when I’m looking at a light plan, I still don’t know what I’m looking at. I have a little bit better sense. But in truth, I really don’t read them. Basically, she was inventing the color wheel. that’s incredible. how did you fit into this? That was for Ballroom. They tried it out of town and it worked, what she was trying to do. Then they were cut because she knew what she wanted, and it went on to Broadway. Then I got a call from her saying, “I want you to meet my friend, Doug Schmidt.” I met Doug Schmidt and they were doing They’re Playing Our Song. And you know, that was it. I was done. I did that while I was working at the ad agency and then I had to go to L.A. for the tech. I thought that was going to be a couple of days, but it ended up being actually quite a long time. I think they were all surprised at how long it took because every time they made a change I had to make a change. I quit my job in advertising and I went away and joined the circus and that was pretty much how it started. I teach at Yale and every kid I teach has got more experience and they grew up their whole life wanting to do this. I didn’t. It’s not what I wanted to do. But I think I’m a fast learner. And I had the dream team to start with. And that was it. I was done. Now that was all I wanted to do. Now I should say that from 1978 to 1994, I never made a living in the theatre. So, I always did other things. And it wasn’t until I did Tommy, that I actually made a living and I could just live on my work as a theatre designer. But before that, I did a lot of industrials. I took a couple of years, I designed Esquire magazine because I had to do these crazy things. So, it’s just the nature of the beast. Being a professor, Do you have any advice for early career individuals and students? You know, I think that you have to listen to the play first. You can’t start with what you are going to do it. You have to really listen to the language of a play, and understand whether or not that language can support projection because projection is ephemeral. And language that is not ephemeral or isn’t alluding to something ephemeral, so I think there’s sort of an inherent conflict. I mostly want them to be better listeners, which is not generally what they think of. They think, “oh, I need more skills. I need more.” No, no no. You need to listen better. And try to distinguish what is the texture of this language?